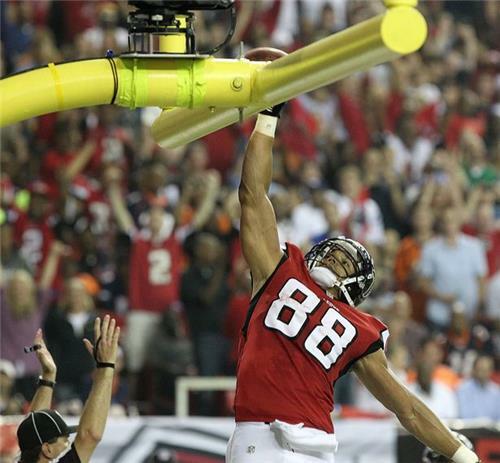 Welcome to the AJC Live360: Atlanta Falcons Mailbag brought to you by McDonald's. D. Orlando Ledbetter will be here every Friday to answer your questions about the Falcons. To join the conversation click the "make a comment box" below. D-Led, any possibility of posting more cheerleader pics? Gracias. Replace Hamilton with Chuck Smith. Has to be Matthews? Clowney will be intriguing, but he was revealed as a shammer this season. Is Clowney still target? Or offensive lineman? So, you would fired him. You going to replace him with? Hamilton has had 5+ years and has not produced a pass rush. That can't be all talent related. The seems to be a reasonable conclusion. Or, they are slow in developing? Is there a deficiency in the scouting department when it comes to assessing offensive linemen? Or do we just have bad luck drafting them? Not my call. You can make a stronger case to retain Hamilton than Hill. In your opinion, does Pat Hill and Ray Hamilton return next year? No. Coach just won his 60th game. Winningest coach in team history. You should be throwing him a parade and not trying to get him fired. 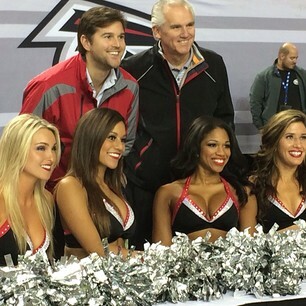 If the Falcons get blown out these last two games, is there any chance Mike Smith gets replaced? Tony Gonzalez working it out. BOB -- "The falcons offense has become way too predictable over the past year, maybe because of the mediocre offensive line. Too may short pass routes where the receiver does a quick turn in or out instead of being hit in stride. Should use Rodgers like Denver uses Welker. Ryan takes too short a drop compared to other QBs then has no pocket to step up into. Antoine Smith has been used sparingly after good production. What gives? Defensive backs give too much cushy on third downs. Just observations from a over 40 year fan of the birds"
LEDBETTER – The short passes and quick drops are because they can’t take 5 and 7 step drops because the line doesn’t hold up. Coach Smith after practice yesterday. I don't know. I'll ask coach Keith Armstrong. 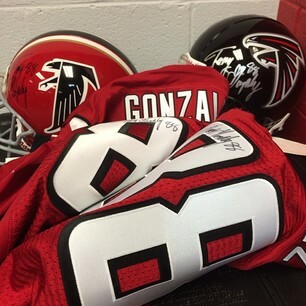 Tony Gonzalez is headed home for one last rodeo in his home state. We'll talk to him later today. LEDBETTER – Yes, yes. But they are going to scrap. They are talking about not letting San Fran walk all over them. It’ll be a rumble early!!!! Maybe they can take them in to the third quarter. But it should be a good battle. Just talked to Coach Reeves about a health and coaching story. He just thinks the injuries exposed the fact that the Falcons depth wasn't what they thought it was. Said they are playing hard, though. DANNY WARE -- My concerns are defense first. I am a high school coach and am convinced that you cannot win at any level without a top ten defense. Second would be the offensive line, we have not drafted well in either area and went cheap on the o-line. The old says "you get what you pay for " has never been more true. Granted we are not prevy to financial records of the team, Dimetroff has to draft better, identify the teams weaknesses and address those needs. We have very smart fans who know where these deficences lie. LEDBETTER – Got to get the lines fixed. The young Dlineman are starting to come around. J ROFRANO – why not give youngsters experience more so than has already been done. to heck with wining any more this year. LEDBETTER – They youngster have played over 900 snaps in the past two games. JOMPS -- I know that there is the "integrity of the game" debate but don't you think the Falcon's should sit their star players the next two weeks to avoid injury and secure a better draft pick? JAY DARWIN -"This question is coming from someone who has played Football, among other sports, so I understand "letdown mentality." My question: ""If you can please, explain how in the last 2 years that so many teams, especially the Falcons can come out so often firing on all cylinders, getting ahead by two or three TD's and struggle or lose in the second half? In essence why do the Falcons lack the killer instinct? LEDBETTER – That usually means the other team is just better. It’s the old Tortoise and the Hare. That’s all. Over time, the best team pulls ahead. They are not trying to fold up. They are getting beat. That’s what competition is about. They are well prepared and that speaks to the good starts. But they can’t sustain because the other team is probably better. ZACK -- Doesn't it concern you when the head coach says that the team has lost 6 "one score" ballgames? Doesn't he realize the MANY flaws that the team has? Lady Luck is not on their side this year and they have been exposed. Why doesn't the coach focus on dominating an opponent so most of the games do not come down to "one score?" He preaches "60 minute" ballgame and that plus a lack of talent carries over into games. And it is scary to hear a coach say "sacks are overrated!" That is poor foolishness when sacks cause a loss of down and yards, possible turnover and a huge swing in momentum. They guy is too soft to take this team to the top and playing a "weak" schedule next year won't fool me one bit. Look at his record vs winning teams and you will get all the proof you need that he should be fired ASAP! So what he has had a few winning seasons! Don't let the Falcons poor history be the reason you suffer through another down season next year. And for heaven's sakes...how hard is it to hire a top offensive and defensive assistant to be your OC and DC? Hire a guy that is part of a top squad to share his influence on what your team is missing on! Why in the hell would you hire a guy that was just FIRED by the Jags?! Is the GOOD OLE BOY NETWORK THAT STRONG?! I mean you have Julio and Roddy and you have a pop-passing attack!?! Might as well run a 3 TE set! Look at how SF and SEA built off of last year and that speaks volumes! And I bet Monday's game won't come down to "one score!" I PREDICT A CANDLESTICK STOMPING FOR SURE! Then watch Smitty give the same lame press conference about how they will "fix" this and that! This is old and I am sick of the hot garbage that they actually want fans to RISE UP and pay to see! UNREAL! SMITTY AND HIS COORDINATORS NEED TO RISE UP AND GET THE HELL OUT OF TOWN! LEDBETTER – Man, dude just became the first coach to win 60 games in franchise history. Has one bad season and you’re ready to jump. Relax over the Holidays! WILLIAM BROOKS -- What do the Falcons adjust in the draft or free agency to get back to Super Bowl contenders? LEDBETTER – FIX THE LINES and get everybody back healthy. BOARD OF EDUCATION -- If Smitty loses another nationally televised game, is it true that Blank will put him in the cut? LEDBETTER – He’ll put himself in the cut. JEFF GREESON -- As a fan, it seems there are non football related issues as to the Falcons seemingly dismissive attitude concerning Antone Smith's lack of playing time....with the team struggling mightily in the running game, why are they so reluctant to put the ball in his hands and see what happens? To a fan, (me) it seems they are unwilling to expose the fact that they overspent on Steven Jackson. LEDBETTER – He’s hurt right now. That’s a moot point. PAPPY HAPPY -- What will the Falcons do to vastly improve their offensive line during the off season? LEDBETTER – WEIGHT ROOM. Draft and free agency. 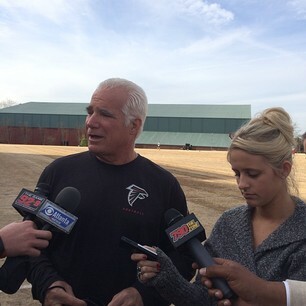 GREG -- "DLed- How fast can the Falcons rebuild? Is it possible to create workable lines on both side of the ball in one offseason? Who stays out of Peters, Jerry, and Babineaux?" LEDBETTER – Should be back in the mix next year if they have good health. Yes, you can fix the lines. I’d keep all of the players who can play. Let them get beat out. That’s where they went wrong last year, showing guys the door too fast. GREG -- Do you think Dimitroff will learn from his failed gamble on an inexperienced and thin offensive line? Do we load up on draft picks or go out and grab some free agents? LEDBETTER – He’s a first time GM experiencing some adversity. He’ll have to SEE IT THROUGH. They’ll pull out of the stops to get this thing turned around. CLIFFORD JOHNSON -- i feel that you all have a good team. all you have is a line issue on both sides of the ball. Please get some impact players at those position. Don't get Matt killed and please get that D-line straight. WILL -- Why aren't the Falcons trying to get backups more experience. I am specifically wondering about Dominique Davis. He needs to get live-game action and now would be a great time to do that. Ryan needs to be rested. He has been hit too many times this year and will get hurt. LEDBETTER – I concur. But Smitty believes Ryan gives them the best chance to win. I suspect we’ll see Davis if things go sideways out in Cally or at the Dome in the finale. RB -- The GM Thomas D having another bad draft. He's just not good at it. LEDBETTER – He hit on the QB and defensive backs! He’s not perfect. None of them are. When you make mistakes, you can’t live with them. Have to keep it moving. RONNIE -- Is there some rule that says the Atlanta Falcons can't be the toughest, most physical team in the NFL? LEDBETTER – Not to my knowledge. 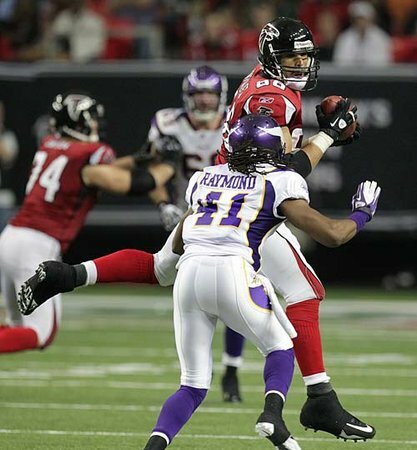 KEVIN BARRY -- I think the Falcons should try to get Jared Allen in the off season instead of getting Clowney in the draft. I would rather the FALCONS GO after a big lineman instead to protect Ryan. Allen could work out better than most because he wants a Super Bowl ring. The Vikings haven't done it. He plays like TG and goes all out. LEDBETTER – I’m sure they’ll be looking in all corners for players. They may need to relax some of their filters and get some football players in here. You have a nice locker room, but if you’re not winning. . . .
JSSN -- What exactly is the status of the rehabs of people like Mike Johnson (UFA), Brady Ewing, Biermann, and Sam Baker? LEDBETTER – Here’s the update on all of those guys. I don’t have anything on Ewing. 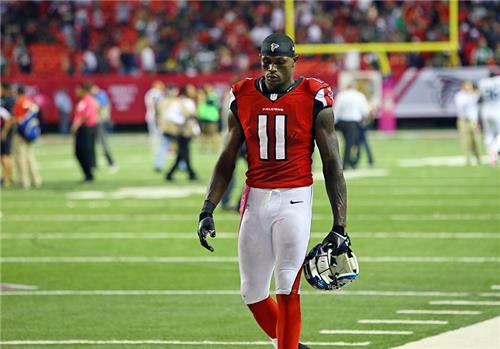 Falcons wide receiver Julio Jones, who is recovering from foot surgery, is off his crutches. Wide receiver Harry Douglas has been in contact with Jones, who hasn’t spoken to the media since his injury and surgery in October. is recovering from foot surgery, is off his crutches. Wide receiver Harry Douglas has been in contact with Jones, who hasn’t spoken to the media since his injury and surgery in October. He was placed in injured reserve on Oct. 10. Falcons coach Mike Smith gave an injury update on several players during his radio segment on the team’s flagship station 790TheZone on Friday. He appeared on “The Locker Room” show with former Falcons tight end Alge Crumpler and JP Peterson. Jones has been in the building for meetings and doesn’t seem to have a sense of isolation. Douglas, who’s 94 yards shy of 1,000 yards receiving, gives Jones credit for his strong season. Linebacker/defensive end Kroy Biermann is recovering from Achilles surgery. He went down in the second game of the season on Sept. 15. He was placed on injured reserve of Sept. 16. Left tackle Sam Baker is recovering from left knee surgery. He was placed on injured reserve on Nov. 12. Offensive lineman Mike Johnson, who suffered a dislocated left ankle and fractured fibula in training camp, is also recovering. He was played on injured reserved on Aug. 9. “Mike Johnson is actually back in the weight room,” Smith said. Overall, Smith believes the recovery picture looks rather promising although he didn’t address fullback Bradie Ewing, who suffered a shoulder injury and was placed on injured reserve on Sept. 16. A lot of good questions have been submitted. About to posting them.